Show Me the House Already - Sheesh! Okay, okay, I'm sorry! 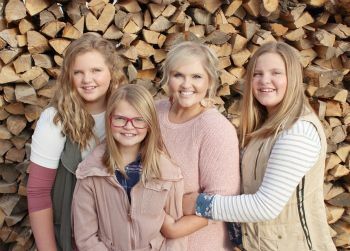 It's been a Ca-Razy Summer, I've been out of town a lot, and like I mentioned before, a 9-6 job with lots of extra projects AND blogging is definitely proving difficult to handle. I'm here to redeem myself though, and I've got some pictures of one of my MOST favorite parts of the house, the kitchen! Well... the kitchen nook actually. We didn't build this house, but it was new and pretty much 99% finished when we decided to put an offer in on it. All we've done so far is add plantation shutters and hire someone to paint the ceilings white to help open up and lighten the spaces all around our home even more. I don't care how out of style I sound, or how "cool" it is now... painted ceilings, in anything other than white, for me?... in the words of Jimmy Fallon (or Sara) "Are, Ew!" The windows in the back of the house, especially in the breakfast/eating nook, were a feature that I completely fell in love with. All that natural lighting makes me giddy. Our light fixture, table, chairs, bench, settee and rug from our old house all looked a bit small for this huge space, but there wasn't any way that I was buying new or changing things. I've always loved this set-up, so I decided to just get a bigger rug from Joss & Main and add our DIY'd console table that was in our old living room, with some chairs flanking either side. 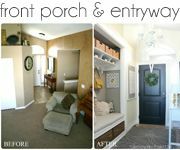 I think a bigger rug made ALL the difference, and really helped fill-in empty space. According to a professional interior designer, I'm sure the rug size may be too big for my furniture's scale, but I don't care, I love it that large, and plus, we never have to worry about the wheels from our settee or legs of our bench snagging on a rug that's too small anymore. Eventually I'd like to get a longer sideboard for under the windows and possibly get rid of the chairs. Maybe something with more drawers for storage, and that's a bit more modern. 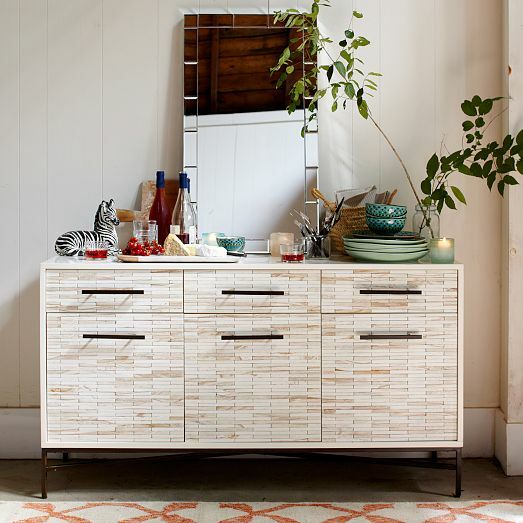 I'd still have to flank something on either side of this buffet bc it's shorter -- via West Elm. Oh, and if you're still following us on Instagram, then you know we've been back at it with some planking action too; I'm excited for that project to get finished as well. 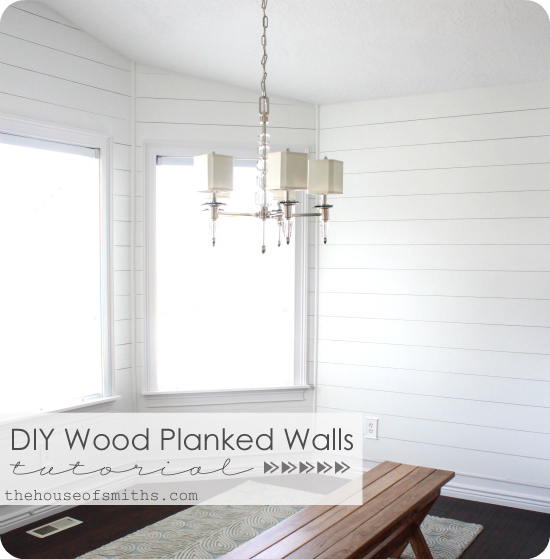 You can see the full tutorial for how we planked the kitchen walls in our last house here. It's one of our favorite treatments by far. Lots going on here - till next time! Yay!! Finally some pictures! But I still just want to see the whole house. Everything's looking gorgeous! 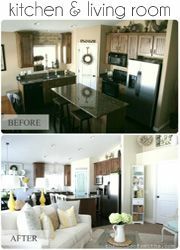 yes, that kitchen sneak peak is gorgeous! Can't wait to see more! Absolutely gorgeous!! I can not wait for the next blog!! I hope you had a fun Saturday night filling holes. 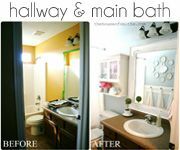 I always (well most of the time, cuz sometimes those house projects can cause some bickering between spouses ;) ) enjoy projects with my hubby. I am sure it will look amazing, as everything else has. I am envious that you can paint your ceilings. Here, that popcorn crap is what they used. Very messy to scrape the main level and upstairs of our two story. Basement is unfinished. But I want to plank the ceiling when/if we ever get around to finishing it. I love reading your post. You are so refreshingly honest! Gorgeous!!! I think that the room's color combo is great! The settee is my favorite piece in the nook...it gives such a special look to the dining area. Thanks for sharing your new house with us! Shelley you are so right...that is one gorgeous nook! can't wait to see the rest of the house. PS. I totally hear you, aren't those real world jobs so pesky? no matter how much we might enjoy them! I like the console table you have there now! It's got a lot of great detail like the old ones do, but you moderned it up (Why doesn't spell check like the word "moderned"? It's a great word!) with the white paint. I also think the comfy chairs look nice there. People like ceilings that aren't white? Nope, I'm with you. White ceilings to make a room look as tall as possible, and to not call attention to themselves. Thanks for the look at part of your new house! Amazing! Everything looks great. I just moved into a new house and the laminate floors were filthy. How did you get yours so clean? Looks great! I recently went back to work as well so I understand not blogging much. Hope your new job is going wonderfully! Looks great! Congrats on the new house! Lovely! Can't wait to see more! I love the color of your walls. Do you know the paint color used? Thanks! Awesome!!! I'm still in love with your dining table and all the seating options. No way would I have gotten rid of it either. If you bigger on your sideboard I'll take that one off your hands. I can't find a small one here in TX. I have been looking everywhere I travel as well. Keep hoping one will pop up at a garage sale! I'm right with ya on the 'painted ceilings fad'...yucka. 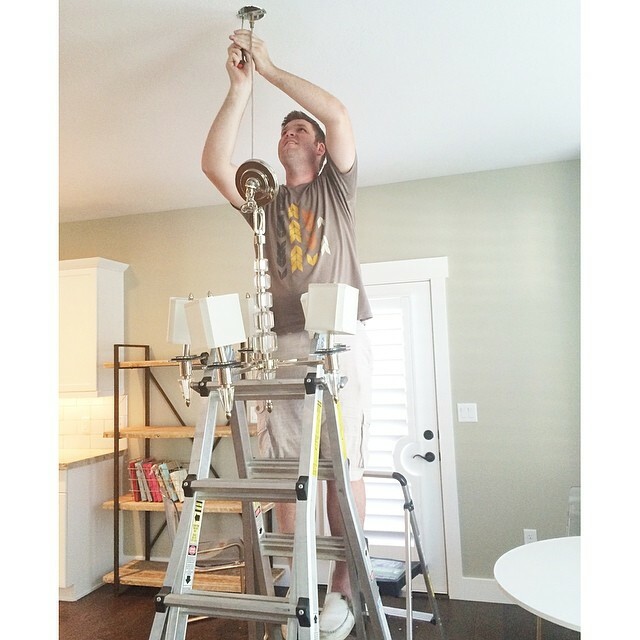 We painted every.single.ceiling white when we moved in (as well as every single wall!) and it made SUCH a difference. It felt like we lifted the ceilings! Gorgeous house, though! It looks so fresh and airy! Gorgeous! I wish you could come decorate my house! Where did you get your topiaries that are on the console? The new place looks great! beautiful little nook!! can't wait to see more! There you are! I was wondering when we'd be able to see the house, but figured you were busy. As for the rug, I don't think it's too big at all. They say when you pull out the chairs to sit on them, the rug should still be under the chair. Too often people use smaller rugs and when they pull out the chairs to sit on them, they are off of the rug. Looks great. Can't wait to see more! Love it! Who is the rug made by? Looks beautiful, can't wait to see more pictures! Beautiful, can't wait to see more! Can't wait to see more of your house! Hello. I commented the other day and still don't see it so I'm trying again. :) That area rug isn't too small and looks pretty. The experts say it should be big enough so when you pull out your chair, it is still on the rug. Too often people buy too small of a rug and then their chair hangs off the end when pulled out. Your room is beautiful! I love the rug and I think the size is great. I agree, white is the only color for a ceiling. :) It really made a huge difference in the brightness of your room. Everything is looking absolutely wonderful - you are adding some fantastic touches! I always heard that an area rug under a table & chairs should be large enough so that when you pull out a chair, it doesn't get caught when you pull the chair back in - so your rug is the perfect size! Can't wait to see the full reveal. Can I ask you where you got the chairs on either side of the console table? 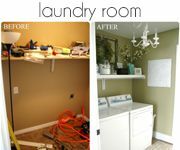 I saw similar ones on a post by homebyheidi.blogspot.com and I LOVE them. Thank you so much! Looks beautiful so far! I love it! Can't wait to see more. So pretty! Congrats on the new house! Can't wait to see the kitchen! Loving the sneak peek!!! I love your dining room!! I love the settee is it practical with lil kids? People just work together to sit down and pull up to the table? Can't wait to see more of your lovely home!! Pretty please share with us your paint color! It is perfect for a room that I am doing! Where is your original sideboard from? I love it and have been looking for one just like it! I love your design style! Can you tell me about you wood floors? Manufacturer, color name etc. Can't wait to see more of your new house! Love everything you did in your old house so can't wait to see you put your touches on this new one. You do a fabulous job!